If the Tigers make the playoffs this season, there’s a pretty good case to be made that Dave Dombrowski deserves to win executive of the year for what he did ahead of his dismissal last August. Of course there are Verlander, Cabrera, Martinez(s), and Kinsler, but he also has all three of the pitching prospects he acquired at the deadline last year contributing at the major league level in 2016. Collectively, Michael Fulmer, Matt Boyd, and Daniel Norris have pitched 242.1 innings as starters this year with an 80 ERA- and 96 FIP-. Fulmer has certainly been the most successful, but Norris and Boyd have also pitched well. One thing that’s been interesting about watching the kids pitch is that we haven’t really had a chance to watch pitchers develop in quite some time. From 2012-2015 or so, the Tigers used a lot of established major league pitchers. Sure Porcello was young, but Verlander, Scherzer, Sanchez, Price, Porcello, and Fister ate up a lot of the innings over the last several seasons. Veteran pitchers tinker all the time, just (don’t) ask Verlander about his new cutter, but it’s a different kind development. But having the young starters this year gives us a chance to watch pitchers figure out the kind of hurlers they are going to be. 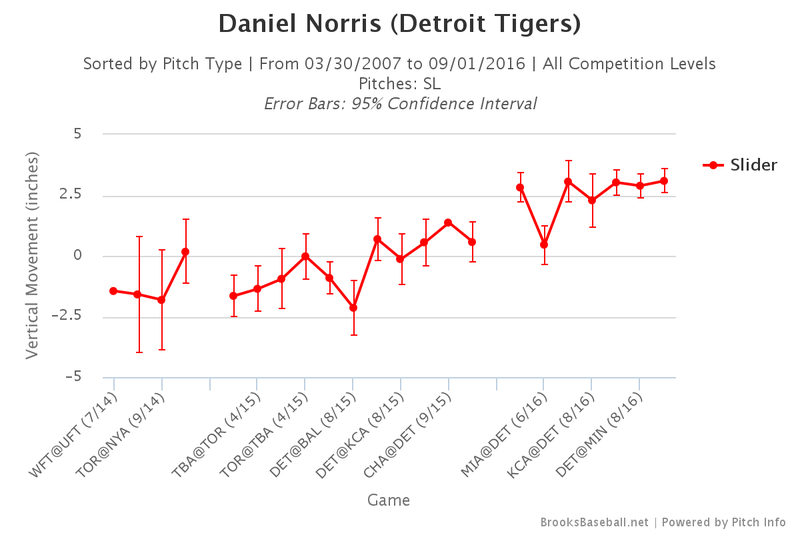 Early season Fulmer was certainly a revelation, but it’s Norris who has my eye at the moment. Everyone knows that Verlander’s taken Fulmer under his wing, but it’s Norris that’s following in the ace’s footsteps more directly. 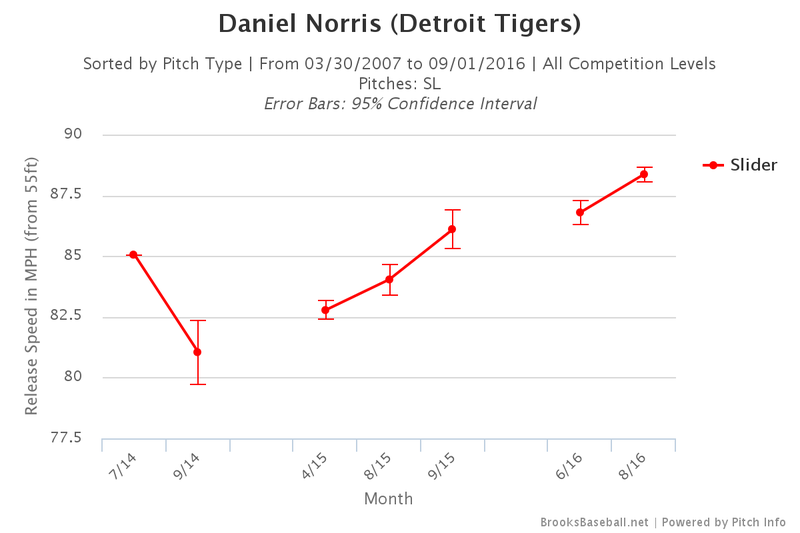 You see, Daniel Norris’ slider is starting to look an awful lot like a cutter. It’s important to keep in mind that pitch types exist within three separate continuums: velocity, horizontal movement, and vertical movement. The names are simple classifications. We’ve decided to give the name “changeup” to a certain cluster of pitches and “curveball” to another cluster in this hypothetical three-dimensional space. The differences between a slider and a cutter are subtle. Cutters are typically thrown a little harder, and with a little less movement in the vertical dimension. Cutters are a little faster with a little less depth, essentially. 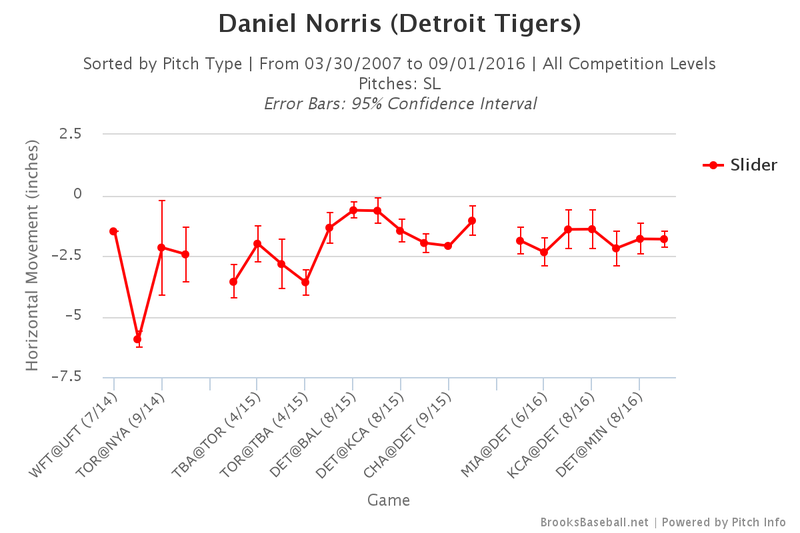 As you can see, Norris is throwing his “slider” faster and with less sink this season and there appears to be a clear trend line as well. If you break it down by month, it’s even more obvious. I’ll omit horizontal break because that’s pretty consistent. I don’t want to make a big deal about what we call the pitch, because Mr. Verlander seemed to get pretty upset that some other analysts and I started calling his “slider” a “cutter,” but Norris is a little more laid back so I’m now too worried. It looks like Norris is throwing a cutter instead of a slider. At the very least, he’s throwing his slider much differently. This is quite interesting because now we have two different Tigers pitchers at different points in their careers (different handedness too) both junking their slider for a cutter-ish type pitch in the same season. There are all sorts of potential starting points for this. Rich Dubee is new. There’s an analytics staff in the front office. Saltalamacchia is also new. 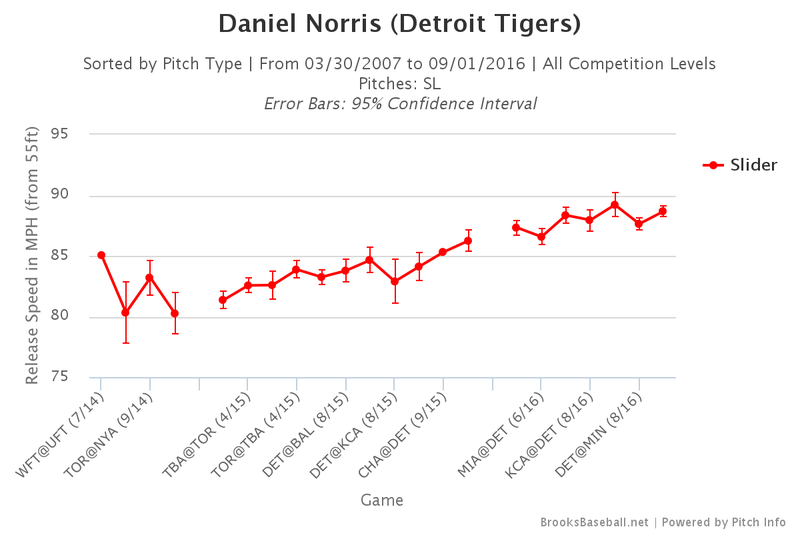 Maybe Verlander figured it out on his own and taught Norris/Norris copied him. We don’t have enough information to be sure, but it’s definitely curious. 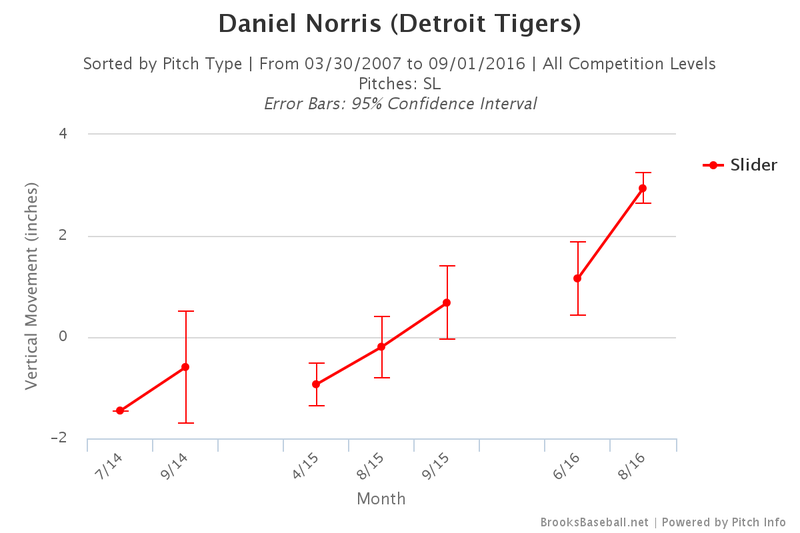 No matter where it started, Daniel Norris is up to something. We haven’t seen him enough to know what it means, but it’s something that merits attention.